In roughly 2003, I came across a very unique little tool called AutoIt that allowed end users to write scripts that it would then compile into an .exe that was stand alone. These stand alone scripts didn't need any other DLLs or anything else to run, ran on virtually all of the Microsoft© Windows platforms, and were pretty cute. In Feburary of 2004, Autoit Version 3 came out. With this version, users were able to create GUI interfaces to activate a more VBScript like language to do things. 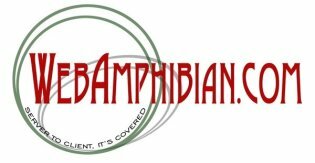 This is when WebAmphibian.Com started to really look at this tool as a good intermediate platform for some of our simple projects.